Dolphin Plaza is one of Hanoi’s premier residential addresses. Conveniently located on the city’s main ring road, with easy access to both central Hanoi and the international airport, Dolphin Plaza offers a magnificent collection of spacious, light filled and carefully detailed apartments designed for a luxury urban lifestyle. Dolphin Plaza is the first award winning national architecture award in 2012 and designed by DP Architects Pte Ltd as one of Singapore’s largest construction design consulting companies. The project manager is Mr Kwak Kyung Shik, director of many famous projects in Korea. From the moment you walk through the sophisticated lobby space you feel as though you have just entered a grand hotel. The concierge greets you from behind an elegant reception desk, welcoming you home. The look that has been created is completely unique for Dolphin Plaza, very stylish, fashionable, yet timeless. 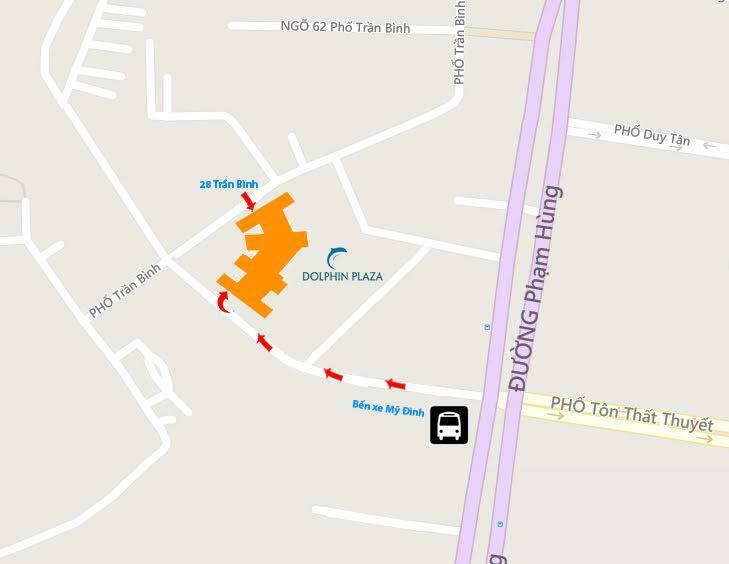 Dolphin Plaza lies not only at the center of Hanoi’s exciting new residential enclave of My Dinh, directly fronting Nguyen Hoang Road in the new Nam Tu Liem district, the capital’s largest and most exciting development area, but also at the heart of its future. Everything Hanoi has to offer just a short trip away – from a dizzying array of restaurants, modern shopping centers, international hotels, National Convention Center, the culture of the famous Old Quarter to the excitement of downtown. Dolphin Plaza offers a selection of one, two and three bedroom apartments and penthouses ranging in size from 72-198 square meters. Designed to provide the very best in Hanoi living, the stylish apartment interiors combine colors and materials to give a rich urban luxury with calming, relaxed accents. Sleek modern surfaces in the kitchens and bathrooms are complemented by the texture of natural wood floors in living areas and bedrooms. Comfort cooling and heating help to create a perfect modern living environment year round. Escape city life and socialize, exercise, and be entertained in the wide range of residents’ facilities that Dolphin Plaza has to offer. After a long day at the office you could go for a swim in the 25 meter pool or work up a sweat in the gym. If all of these activities are too energetic for you there is always the residents’ lounge and Sky Garden terrace for relaxing and taking in the city views; you could even hire out the private Heritage Space for those larger get-togethers.